Carburetor Parts & Rebuild Kits - Carburetor Parts Superstore! Conditions of Use-	Welcome to QuadrajetParts.com and all of its subdomains, the website developed by Gessler Head Porting (GHP) to serve as your source for searching and purchasing the items you need. By accessing this website, you agree to be bound by the terms and conditions of use. Please read them carefully. Access to and use of the information, products and services available through this site are subject to the following terms and conditions. By using the services, you are agreeing to these terms and conditions. Please contact us with any questions. Unless expressly provided herein, the services are licensed to you for your online viewing only. No further reproduction or distribution of the services is permitted. PRODUCT NOTICE AND DISCLAIMER- Some of the products available through QuadrajetParts.com are for off-Road use only. ELECTRONIC COMMUNICATIONS- When you visit QuadrajetParts.com or send e-mails to us, you are communicating with us electronically. You consent to receive communications from us electronically. We will communicate with you by e-mail or by posting notices on this site. You agree that all agreements, notices, disclosures and other communications that we provide to you electronically satisfy any legal requirement that such communications be in writing. 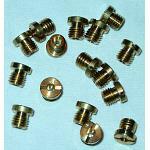 RISK OF LOSS- All items purchased from QuadrajetParts.com are made pursuant to a shipment contract. This means that the risk of loss and title for such items pass to you upon our delivery to the carrier. PRODUCT INFORMATION AND DESCRIPTIONS- The prices displayed at the Site are quoted in U.S. Dollars and are valid and effective only in the United States. QuadrajetParts.com attempts to be as accurate as possible. However, QuadrajetParts.com does not warrant that product descriptions or other content of this site is accurate, complete, reliable, current, or error-free. If a product offered by QuadrajetParts.com itself is not as described, your sole remedy is to return it in unused and unopened condition. INDEMNIFICATION OF QuadrajetParts.com- As a condition of using this web site, you agree to indemnify and hold harmless QuadrajetParts.com, its officers, directors, employees and agents, and their respective successors and assigns, from and against any cause of action, loss, liability, damage, cost or expense of any nature whatsoever, whether accrued, absolute, contingent or otherwise, including, without limitation, attorney fees and costs (whether or not suit is brought), arising out of claims resulting from your use of this web site, including, without limitation any claims alleging facts that if true would constitute a breach by you of these Conditions of Use. SITE POLICIES, MODIFICATION, AND SEVERABILITY- Please review our other policies, posted on this site. These policies also govern your visit to QuadrajetParts.com. We reserve the right to make changes to our site, policies, and these Conditions of Use at any time. If any of these conditions shall be deemed invalid, void, or for any reason unenforceable, that condition shall be deemed severable and shall not affect the validity and enforceability of any remaining condition. It is your sole responsibility to regularly review such terms and conditions. Continued use of this website following any such changes shall constitute your acceptance of such change. RESPONSIBILITY FOR YOUR ACCOUNT- If you use this site, you are responsible for maintaining the confidentiality of your account and password and for restricting access to your computer, and you agree to accept responsibility for all activities that occur under your account or password. If you are under 18, you may use QuadrajetParts.com only with involvement of a parent or guardian. QuadrajetParts.com and its affiliates reserve the right to refuse service, terminate accounts, remove or edit content, or cancel orders in their sole discretion.